The fleet of general aviation aircraft is aging. Mandated maintenance promotes reliability, but experienced pilots know mechanical issues can still arise, sometimes far from an open FBO. The CruzTOOLS Pilot's Tool Kit provides the most common tools and other contents to help get you airborne, including a set of combination wrenches, 8" adjustable wrench, tire pressure gauge, locking pliers, 6-in-1 screwdriver, hex wrenches, and diagonal cutters. A special aviation spark plug socket (also sold separately) handles most spark plug makes, and a way-cool mini-ratchet and socket set provide additional utility. Finally, a telescopic mirror, cable ties, and 30 feet of 0.032" aviation-grade safety wire are included. Everything is nicely organized into a tough roll-up pouch. While designed to carry on the plane, this may well become your go-to kit for the hangar or ramp. Tools carry a lifetime warranty and are made to precision tolerances using pro-grade alloys, but more importantly they are absolutely dependable when called upon. Pros: Well made and easy to access. Review: This is a very smart package. I'm no longer digging around for the couple of tools that I need on a regular basis. Review: Perfect tools for that unexpected emergency. 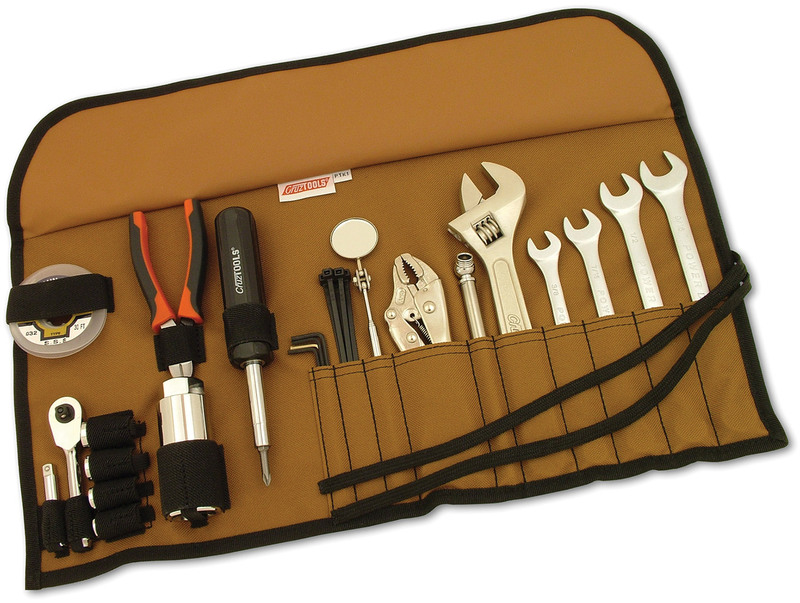 Review: The kit is complete with necessary tools to address most tasks. It's the right size and weight to fit conviently in my aircraft the case is perfect to roll up your tools and store ready to be used again. Try it out. There grrrrreat! Cons: A little heavy. I took out the spark plug socket. Q: Wrenches and hex wrenches - metric or standard? A: These are all standard units of measure.